Happy New Year & a very Happy 5th Anniversary! No doubt like me you’ve now polished off those Fairtrade Christmas Chocolates and pulled up your new Fairtrade Cotton socks, ready for an assault on the New Years Resolutions. But before you do, I want to say a huge thank you to all those of you that have supported the cause of Fairtrade in 2012. In amongst the jubilee and the famous summer of sport, something every bit as remarkable occurred. Nearly 1 million people across Wales and the UK took a Step for Fairtrade. Whether you’re a member of a local Fair Trade group or work at a Fairtrade School. Whether you switched your tea last year or convinced your workplace to switch theirs. Whether you took one small step or a giant leap, your contribution has helped to make a huge impact to lives of Fairtrade producers around the world. Thats 1.5 million producers empowered to work their way out of poverty, 7.5 million people benefitting from a fairer way of trading and millions more of us who can take pride in having stood up for values beyond just price. Happy Anniversary to the Fair Trade Nation! It doesn’t stop there either. This year promises to be even more important than last as we celebrate five years as a Fair Trade Nation. We’ll be marking the occasion by asking the people of Wales to tell us what Fair Trade means to them and encouraging you to share where you think the Fair Trade Nation should head next. Check out some ideas as to how you can celebrate the Fair Trade Nation this year. Celebrate the Nation - why not take part in an impromptu pop-up party. You can invite members of your community to join you for Fairtrade Tea and even blow out the candles on a Fairtrade cake. Create the Nation - tell us what Fair Trade means to your local areas. You could take a photo of with a local landmark given a Fairtrade twist or maybe you’d like to pen a poem or song instead. Debate the Nation - maybe you’d like to share your thoughts on fair trade with friends and key members of the community. How about putting on a Fair Trade Nation debate? You can keep up to date on all the latest Fair Trade news by following us on Facebook and Twitter or checking out our brand new website. There’s something for everyone, so be sure to check out some of the useful links below for helpful resources and advice. In the meantime, from all the team at Fair Trade Wales, Happy New Year. We look forward to working with you all again on what promises to be an exciting year of Fairtrade Festivities. Fairtrade Fortnight takes place every year at the end of February and offers an opportunity for people up and down the country to celebrate the positive impact of Fairtrade. Wales celebrates its fifth anniversary as the worlds first fair trade nation with a host of events around the country. The autumn promises a whole host of exciting Fair Trade activities so keep a look out for updates from the Fair Trade Wales team. Holt and Undy Primary Schools! 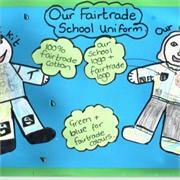 Pupils from both schools have won prizes in the Fairtrade Foundation’s ‘Fairtrade School Uniform of the Future’ Competition! Owen Gaughran from Holt CP School and Taylor and Lucy from Undy Primary were the lucky winners. They had drawn fantastic uniform designs and described how they market their unform to ensure people understood the Fair Trade elements. Their designs will be made up by KoolSkools ready for Fairtrade Fortnight 2013 and each of the schools had a visit from Fairtrade banana farmer Nicholas Faisal.